Whilst his career in his homeland has been fairly limited, Waris Majeed’s stardom in his homeland of Ghana is only likely to grow, as he battles for at least a supporting role to Black Stars goal machine Asamoah Gyan at the upcoming World Cup in Brazil. 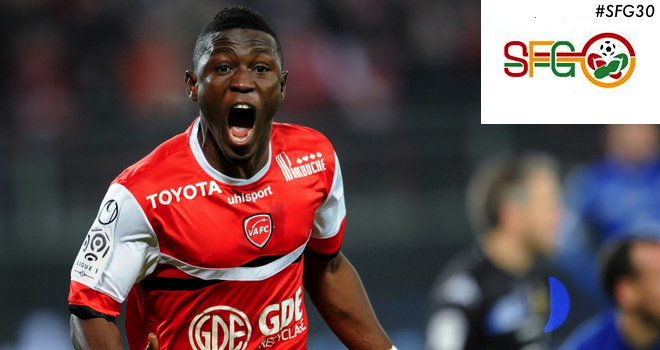 A fairly diverse career so far despite being only 22, spanning five countries with mixed levels of success, his recent loan move to Valenciennes is where he will be hoping to confirm his slot on the Ghanaian squad list this June. Born in Tamale with a full name of Abdul Majeed Waris, he recieved an excellent start in football as he joined a prominent Ghanain talent production factory. The Right To Dream Academy – founded by ex-Manchester United Africa scout Tom Vernon – has considerable links across Europe, with Waris Majeed probably the biggest name on the list of alumni as it’s talent begins to ripen. Moving to England to attend Hartpury College in 2008, where he played in the Forest Green Rovers reserve side, he was quickly whisked off to elsewhere in Europe. Signing up to play for Swedish side Hacken, he quickly became a hero in the short time that he spent in Scandinavia, and truly announced himself to the footballing world. Banging in 26 goals in the 45 league appearances that he made in the Swedish Allsvenskan, he was named the league’s Player of the Year in the 2012 season, as well as finishing top scorer. With Ghanaian Football Association President being quoted as saying “his footballing achievements have brought honour to our country” when discussing Majeed’s incredible exploits, it was no wonder that the clubs were sniffing around to bring him to one of the more prominent leagues in Europe. With numerous clubs rumoured to be after his signature, including the likes of Arsenal, Werder Bremen and Hamburg, Hacken new that their young star’s brief spell in Sweden was almost over already. Picked up by Russian Premier League side Spartak Moscow, in November 2012, Majeed’s career has largely stalled. Deemed inferior to the numerous strikers that are ahead of him in the pecking order, including Emmanuel Emenike last season and Yuri Movsisyan this, the fact he has only made around 10 appearances in the Russian League is a testament to the frustration he must have felt. Now on loan to Valenciennes in Ligue 1, Majeed has been quite the star in France, scoring 8 goals in 11 appearances at the time of writing. Now making noises about perhaps extending his stay, it seems that he may be moving away from Spartak this summer, citing the significantly more playing time as a factor. A speedy, powerful forward, Majeed’s strengths really lie in his finishing, with an in-step style finish that Theirry Henry would be proud of. Able to score from all areas around the box, Majeed’s natural eye for goal is something very exciting for Ghana, and would seem to be the natural heir to Asamoah Gyan’s reign at the spear of the Black Stars attack. Indeed, the lack of competition for this spot other than Gyan works in Majeed’s favour, and may be seeing more of him should Gyan have one of his rather frequent off-days.